Property Tax Reductions for Millions of Properties Due to Real Estate Crisis. The real estate crisis that unfolded during 2007 and 2008 affected millions of California property owners and thousands of local governments. Alongside its broader economic effects, which included widespread foreclosures, reduced construction activity, and diminished household wealth, the decline in property values resulted in temporary property tax reductions for 3.2 million properties—about 2.6 million homes and 600,000 other properties. These property tax reductions were required by Proposition 8 (1978), which modified the provisions of Proposition 13 to explicitly allow for such reductions when property values fall. Local Revenues Reduced by Billions of Dollars. For homes that received property tax reductions in 2013-14, the average homeowner received a $1,600 reduction in his or her property tax payment. For other properties that received property tax reductions—mainly apartments, commercial buildings, industrial facilities, and agricultural land—the average owner received a $7,500 property tax reduction. In total, temporary property tax reductions depressed local government property tax revenues by an estimated $7 billion in 2013-14, amounting to a 15 percent reduction statewide. Real Estate Market Recovery Means Large Property Tax Increases for Many. The state’s real estate markets are recovering. Home values increased 12 percent during 2012, yet property taxes for most property owners were largely unaffected. This is because state law limits property tax increases for most properties to 2 percent each year. However, taxes on properties with temporary tax reductions under Proposition 8 can increase faster than 2 percent each year. Property taxes for these properties increase based on the property’s market value because these properties are assessed at market value each year that they receive a reduced assessment. Real estate improvements during 2012 resulted in property tax increases ranging from 5 percent to 20 percent for many of these properties in 2013-14. Looking ahead, property tax payments for many owners that received temporary property tax reductions during the real estate crisis could increase by more than 10 percent annually for the next several years. These increases likely will cause local property tax revenues to grow swiftly over the next several years as well. For many California taxpayers, the property tax is one of the largest tax payments they make each year. For thousands of California local governments—K-12 schools, community colleges, cities, counties, and special districts—property tax revenues form the foundation of their budgets each year. Despite the major role that property taxes play in California finance, many issues related to this system are complex and not well understood. The purpose of this report is to highlight one such issue—reduced assessment properties under Proposition 8 (1978). This report describes California’s property tax assessment system and details how it responded to the recent real estate crisis. It also reviews how temporary property tax reductions affected taxpayers, local governments, and the state. Lastly, it highlights how this system is responding to the recent and widespread recovery in real estate prices. 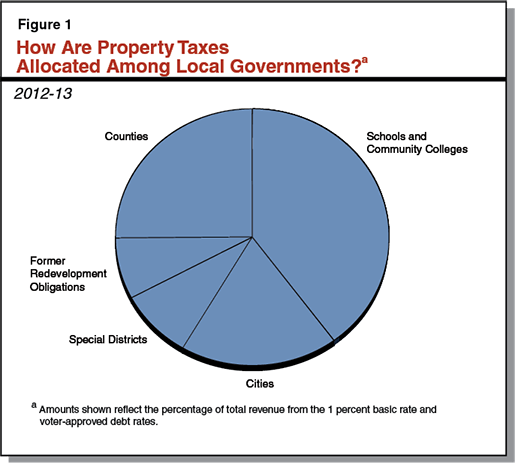 Property Taxes Are a Major Revenue Source for Local Governments. The property tax is California’s second largest source of tax revenue. About $50 billion in property taxes each year is collected and distributed to local governments—including counties, cities, school and community college districts (schools), and special districts. Figure 1 shows how property tax revenues were distributed statewide to these governments in 2012-13. Property taxes are collected by the county and distributed to local governments within that county. The share of countywide property taxes each type of local government receives varies in each county. Property Taxes Also Affect the State Budget. Under the state’s education finance system, schools receive a certain level of general purpose funding, as specified in the annual budget act. Schools receive this funding from a combination of local property tax revenue and state General Fund revenues. If a school’s property tax revenue is insufficient to achieve the specified funding level, the state provides General Fund revenue to meet this requirement. Local property taxes therefore affect the state budget because increases in local property tax revenue allocated to schools typically offset state spending on education. How Does California’s Property Tax System Work? Most Property Taxed Based on Its Purchase Price. In California, owners of real property (land and buildings) pay an annual one percent tax based on their property’s taxable value, or “assessed value.” Proposition 13 (1978) established the process county officials use to determine the assessed value of real property. Under this system, when real property is purchased, it gets an assessed value that is equal to its purchase price, or “acquisition value.” Each year thereafter, the property’s assessed value increases by 2 percent or the rate of inflation, whichever is lower. This process continues until the property is sold, at which point it again is assessed to its most recent acquisition value. In other words, a property’s assessed value resets to market value each time it is sold. In most years under this assessment practice, a property’s market value is greater than its assessed value. This occurs because assessed values increase by no more than 2 percent per year, but market values tend to increase faster. Thus, as long as the property does not change ownership, its assessed value increases predictably each year and is unaffected by faster increases in its market value. 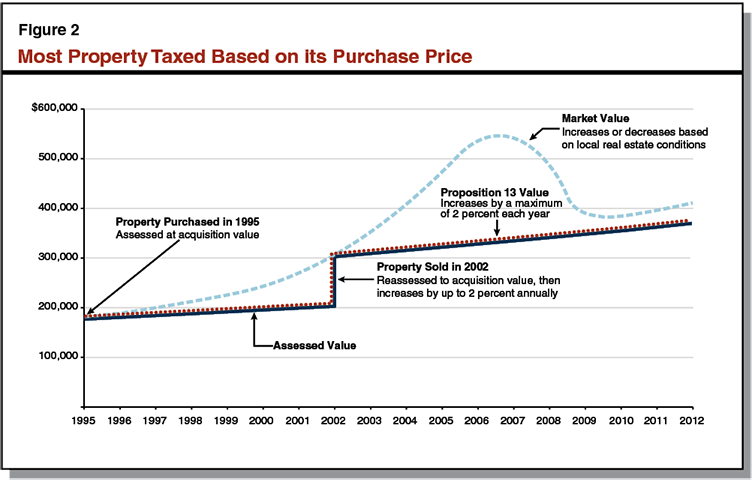 For example, Figure 2 shows how a hypothetical property purchased in 1995 for $185,000 would be assessed in 2012, after having been sold in 2002 and reassessed at that time to its purchase price of $300,000. In this example, the property is assessed at its Proposition 13 value each year. What Happens When a Property’s Value Falls Below its Proposition 13 Value? When real estate values decline, a property’s market value may fall below its Proposition 13 value, which is based on the property’s most recent acquisition value. Without an adjustment to its assessed value, the property would be taxed based on an amount greater than it is worth. In these events, county officials reduce the assessed value of a property by lowering it from the property’s adjusted acquisition value under Proposition 13 to its current market value. Properties that receive lower assessed values are called Proposition 8 “reduced assessment properties” after Proposition 8, which explicitly allows for this assessment reduction. Due to the recent downturn in the state’s real estate markets, one-quarter of all properties—about 3.2 million—have assessment reductions under Proposition 8 in 2013-14. Figure 3 illustrates the assessment of a hypothetical Proposition 8 reduced assessment property over time. 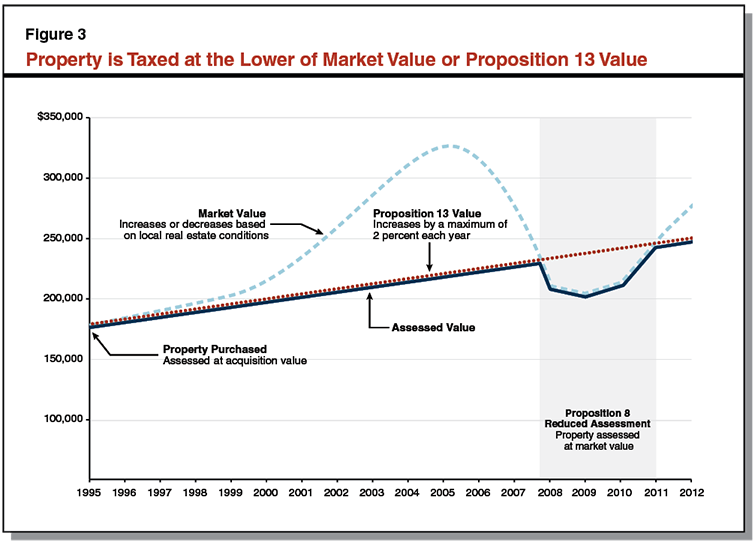 The market value of the property purchased in 1995 stays above its Proposition 13 assessed value through 2007. Then, a significant decline in its market value drops the property’s market value below its Proposition 13 assessed value. At this time, the property receives a reduced assessment that is less than its Proposition 13 value. For three years, the property is assessed at market value, which may increase or decrease by any amount. By 2012, the property’s market value has risen to what its assessed value would have been under Proposition 13. In later years, the property’s assessed value is determined by its original acquisition price adjusted upward each year by as much as 2 percent. In this example, the property is assessed at its Proposition 13 value in some years and its market value in others. Many Property Owners Purchased During the Real Estate Boom. 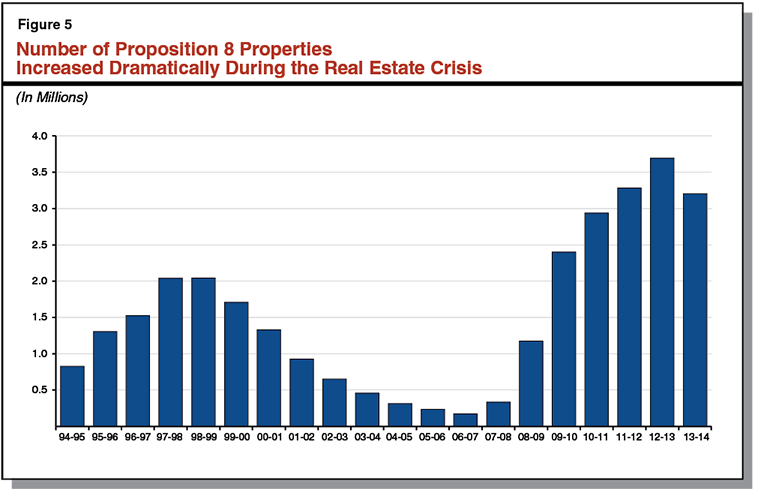 The recent real estate crisis unfolded after several years of pronounced real estate activity during the mid-2000s. Unprecedented new construction, home price increases, and home sales levels characterized this boom. 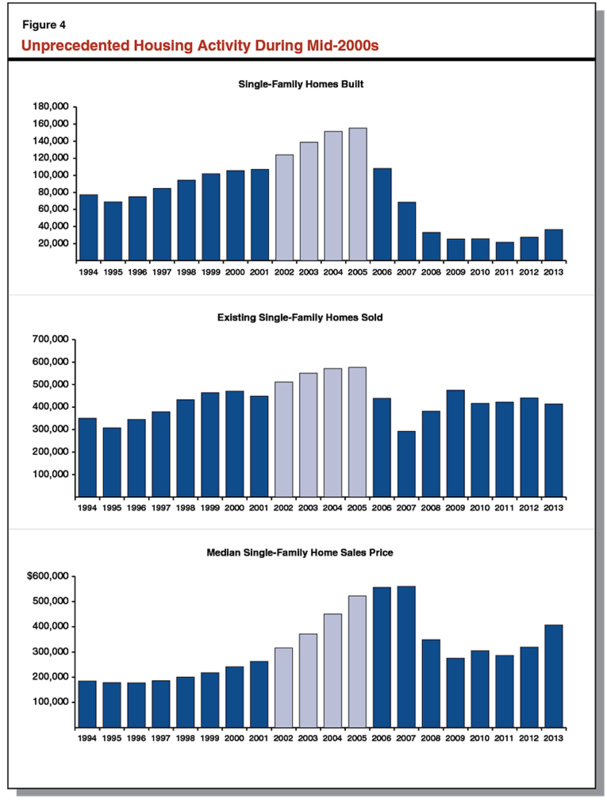 Figure 4 shows these trends for: (1) single-family homes built, (2) existing single-family homes sold, and (3) the median single-family home sales price each year. One important outcome of this housing boom was that many Californians became recent homeowners and most of them bought at or near peak home prices. This interaction would have significant property tax consequences. As the housing crisis hit in 2007, many homeowners, especially recent buyers, had high acquisition values for property tax purposes. Also, because they purchased near the peak, market values for these homes were similar to their assessed values. Many of these newer owners would receive Proposition 8 reduced assessments as the real estate crisis unfolded. The Number of Proposition 8 Properties Increased Dramatically During the Crisis. Figure 5 shows the number of properties with reduced assessments under Proposition 8. During the housing boom between 2002 and 2005, only 3 percent of properties on average had reduced assessment each year. As real estate values fell in 2007 and 2008, the share of properties with reduced assessments increased tenfold. At its peak in 2012-13, about 3.7 million properties, or one-third of all properties, had reduced assessments. Concentrated in Counties Hardest Hit by Housing Crisis. Not surprisingly, reduced assessment properties were concentrated in counties hardest hit by the real estate crisis, where price increases had been greatest during the mid-2000s. Construction contractors, responding to price signals at the time, built significant new commercial and residential developments in these areas. Figure 6 shows the relationship between home price declines and the onset of reduced assessments for counties with the highest shares of reduced assessments. In particular, it shows (1) the decline from peak to bottom for median single-family home sales price and (2) the percentage of properties in that county that received a reduced assessment in 2013-14. Figure 7, for comparison, shows a statewide perspective of the share of properties in each county that received a reduced assessment in 2013-14. Concentrated Among Single-Family Homes. Most of the Proposition 8 reduced assessment properties are single-family homes. Homes and condominiums make up about 80 percent of properties with reduced assessments. The rest consists mainly of apartments, commercial buildings, industrial facilities, and agricultural land. How Did Proposition 8 Affect Property Owners During the Crisis? How Do Proposition 8 Properties Return to Their Proposition 13 Assessments? A property under reduced assessment returns to its Proposition 13 value in one of two ways. First, its market value increases faster than 2 percent each year until it exceeds the amount that its assessment would have been had its market value never declined. Each year thereafter, the property’s Proposition 13 value cannot increase by more than 2 percent each year. The second way a property under reduced assessment returns to its acquisition-based value is when it is sold. This occurs because properties are assessed at their acquisition value (purchase price) when they change ownership. Of the 500,000 properties that returned to their Proposition 13 value assessment in 2013-14, about 60 percent did so due to market value increases and 40 percent did so after being sold. How Did Proposition 8 Affect Governments During the Crisis? In reducing property taxes for millions of owners, reduced assessments also affected local government finances. For many of California’s 4,000 local governments, property tax revenues are the foundation of their annual budgets. Not surprisingly, Proposition 8 reduced assessments have affected the services these governments have been able to provide. Reduced Assessments Also Increased State Spending on Education. About 40 percent of local property tax revenues go to schools. In most cases, property tax revenues that go to schools and community colleges offset required state spending on education. As a result, most reductions in school property taxes are made up by increases in state resources for education. Thus, the 3.2 million Proposition 8 reduced assessments, which lowered total local property taxes by about $7 billion, likely increased state education spending by about $3 billion in 2013-14. By official measures, the Great Recession ended in 2009. 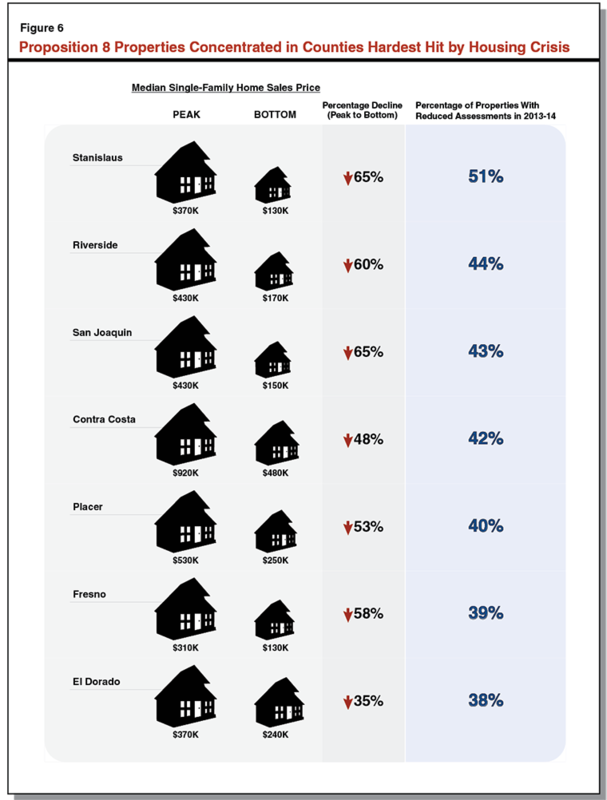 California’s housing markets nevertheless continued to struggle. In early 2012, however, localized real estate improvements spread and the housing recovery gained momentum. Home values statewide climbed 12 percent in 2012. Below, we describe how this pronounced improvement affected property owners with reduced assessments and how it has affected local government revenues. Number of Proposition 8 Properties Declined in 2013-14. For the first time since 2006-07, the number of Proposition 8 reduced assessment properties declined in 2013-14, from a peak of 3.7 million in 2012-13 to 3.2 million in 2013-14. As mentioned earlier, about 60 percent of this decline resulted from price appreciation, where the 2013-14 market value of reduced assessment properties exceeded their original assessment under Proposition 13. Relatedly, because real estate markets have been strengthening, it is unlikely that many additional properties received Proposition 8 reduced assessments in 2013-14. Many Proposition 8 Property Owners Saw Increased Assessments in 2013-14. In general, areas where real estate values have increased recently have seen correspondingly large assessment increases for properties under Proposition 8. In the near term, many of these owners will experience increases in their property taxes that are much larger in percentage terms than increases for owners whose property did not receive a reduced assessment. For example, single-family homeowners with reduced assessments in Los Angeles County saw average assessment increases of 5 percent in 2013-14. Commercial properties with reduced assessments had their assessments increased, on average, by 9 percent. In Santa Clara County, assessment increases in 2013-14 for single-family homeowners with reduced assessments averaged 13 percent. For condominium owners, the average increase in assessed value was much higher—20 percent. 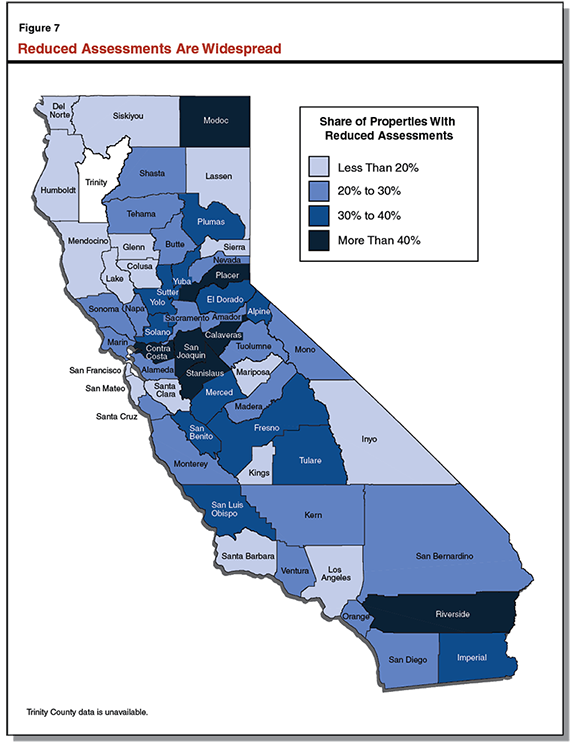 In Sacramento County, assessments for reduced assessment properties increased on average by 6 percent. Proposition 8 Properties Contributed to Property Tax Growth in 2013-14. Proposition 8 properties reduced local property tax revenues during the real estate crises. As real estate markets recover and these properties begin to see large annual assessments increases, Proposition 8 has the opposite effect. This is because assessment increases for these properties are not limited to 2 percent; instead, they can increase or decrease by any amount, based on local real estate conditions. In particular, annual assessment increases above 2 percent contribute to growth in local property taxes because this growth exceeds what would have occurred if the property’s assessment increase remained limited under Proposition 13. In many counties, Proposition 8 property assessments increased in 2013-14 for the first time since the recession began. In Los Angeles County, for example, assessments for Proposition 8 properties increased by a total of $10 billion in 2013-14, generating additional property revenues of $120 million for local governments there. Assessment Increases Expected to Continue and Perhaps Accelerate. Real estate prices improved in calendar year 2012. As a result, 2013-14 property tax assessments, based on property values as of January 1, 2013, increased for many reduced assessment properties. Most of the recent home price gains, however, occurred after January 1, 2013, and therefore are not included in the 2013-14 assessment determinations. In particular, California home values increased 12 percent in 2012 (included in the 2013-14 assessment determinations), but went on to increase almost 20 percent in 2013. For 2014-15, mindful of this timing, we expect large assessment increases—as much as 10 percent or 20 percent in many cases—for properties that currently have reduced assessments. Going forward, property tax increases for owners that received temporary reductions during the real estate crisis could exceed 10 percent annually for several years. These increases will boost local property tax growth rates over the next several years. At the same time, the number of reduced assessment properties will decline as assessment increases climb above their original Proposition 13 assessment value and reduced assessment properties change ownership. Acknowledgments: This report was prepared by Chas Alamo and reviewed by Jason Sisney. The Legislative Analyst’s Office (LAO) is a nonpartisan office which provides fiscal and policy information and advice to the Legislature.